Lock in a great price for Alpine Resort Goies Superior - Adults Only – rated 9.3 by recent guests! Sehr schönes Hotel, sehr gutes Essen, zuvorkommendes Personal - nahe vom Lift - alles perfekt! Extrem freundliches Personal am Empfang! Sehr schönes Zimmer. De locatie ligt top tov de skilift in ladis. Het ontbijt en het diner zijn echt super. Het personeel is supervriendelijk. Het hotel is natuurlijk niet een van de goedkoopste maar is zijn prijs meer dan waard. een prachtig hotel dichtbij de piste van Ladis het personeel zeer behulpzaam en vriendelijk. de accommodatie was super en rustig. 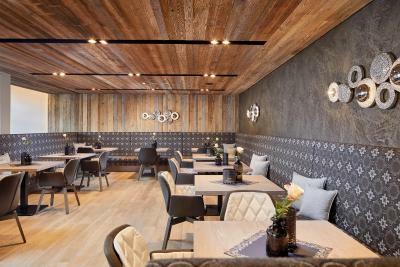 parking 9 euro per dag is wat veel gezien de prijs van de accommodatie nog hotels gedaan in Oostenrijk 4 xxxx Sup maar deze is qua eten toch wel de minste. 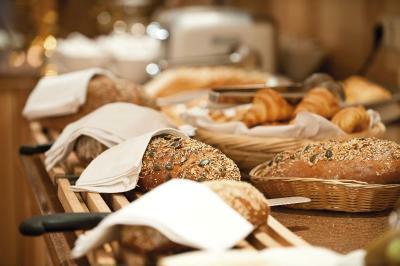 ontbijt na 8 u 30 niet meer aangevuld op is op ! zes gangen menu 's avonds weinig variatie veelal dezelfde smaken wat jammer, gezien we in Oostenrijk al beter hebben gehad. prachtig skigebied voor elk wat wils. Das Personal ist wirklich sehr freundlich und hilfsbereit. Die Lage ist ideal, man geht gerade über Straße und ist direkt am Skilift. Der obere Bereich der Saunalandschaft ist neu und ansprechend gestaltet. Kulinarisch ist diese Hotel sehr zu empfehlen. wunderschönes, sehr gastfreundliches Hotel mit mehreren äusserst vielfälltigen und schönen Wellnessbereichen. Ebenfalls ist die Küche inkl. Service hervorragend. Ein besonderes Plus ist die Lage direkt an der Gondel. Unserem Wunsch nach einem ruhigen Zimmer wurde Rechnung getragen, allgemein ist aber das Hotel bereits ruhig gelegen. Sehr saubere Zimmer. Gute Lage.Hervoragende Küche.Freundliches und herzliches Personal.Hervoragendes Frühstücksbüffet. Haben uns sehr wohl gefühlt. Auch der Wellnessbereich lässt keine Wünsche offen. Alpine Resort Goies Superior - Adults Only This rating is a reflection of how the property compares to the industry standard when it comes to price, facilities and services available. It's based on a self-evaluation by the property. Use this rating to help choose your stay! 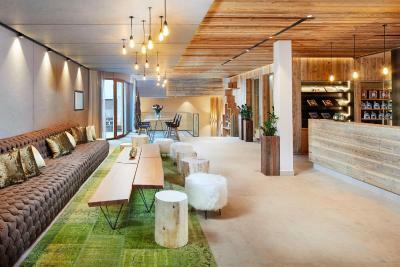 One of our top picks in Ladis.Located in Ladis in the Serfaus-Fiss-Ladis Ski Region, the 4-star Superior Alpine Resort Goies - Adults Only offers rooms and suites with satellite TV, a private balcony and a free internet connection. 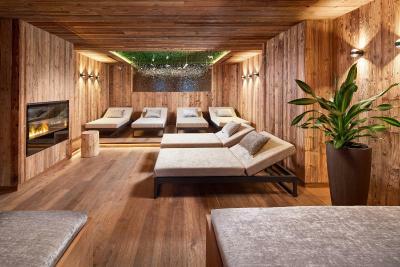 The hotel has a spa and wellness center and is just 350 feet from the closest cable car station. 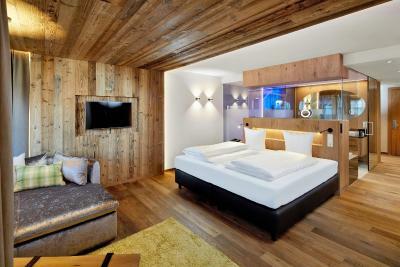 Each room of the Goies features a stylish and elegant interior design with wooden furniture. All include a safe, radio and work desk. Each private bathroom has slippers, a bathrobe and a hairdryer. Some rooms come with a sauna, an infrared cabin, waterbeds or a spa bath. The hotel organizes a recreational program with hiking, Nordic walking and aquagymnastics. Guests also have access to a fitness room and a relaxation room with waterbeds. 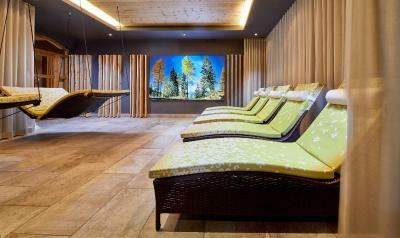 The Alpine Resort Goies has an indoor pool, massage parlor and beauty salon. 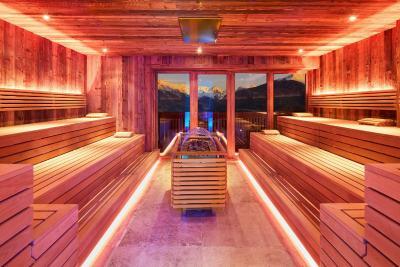 It offers a bio and a Tyrolean sauna as well as a steam bath. In the summer hiking and bike tours are organized. Guests benefit from the Super Summer Card, which includes free use of 6 cable cars and a shuttle bus to the hiking areas in Serfaus-Fiss-Ladis. When would you like to stay at Alpine Resort Goies Superior - Adults Only? This room features a balcony, a seating area, and a bathroom with shower and toilet. These suites, on the first and third floors, are equipped with a double bed, a sofa, a flat-screen TV with satellite channels, a safe, a mini-bar, a telephone and equipped with a balcony or a terrace. The open-plan bathroom has double basins, a spa bath, a shower, a hairdryer and a separate WC at its disposal. Variations from the images and floor plan are possible. This luxurious suite features a roof-top terrace, a round bed, a living area with a fireplace, and a private spa area with a spa bath, a sauna and a spa shower. The Deluxe Suites are designed with comfortable high end furniture completed with wood floors. The Suite features a 6.9 ft long bed, a comfortable couch, mini-bar, safe, Flat Screen-TV, satelite channels, telephone and a sunny balcony. The Bathroom features a Walk-in Shower, Hairdryer and a private toilet. House Rules Alpine Resort Goies Superior - Adults Only takes special requests – add in the next step! Alpine Resort Goies Superior - Adults Only accepts these cards and reserves the right to temporarily hold an amount prior to arrival. Please note that children under 12 years can not be accommodated in this hotel. Please inform Alpine Resort Goies Superior - Adults Only of your expected arrival time in advance. You can use the Special Requests box when booking, or contact the property directly using the contact details in your confirmation.